Hundreds of workers at a Fife power station have staged an unofficial walk-out in support of workers in England protesting over use of foreign labour. The contract workers based at Longannet Power Station walked off shift after a meeting on Thursday. They are supporting contract workers in England who say that other companies are using Spanish and Italian staff ahead of UK-based staff. 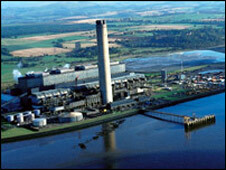 Workers at Grangemouth remain at work but are to attend a meeting on Friday. A Scottish Power spokeswoman said: "Scottish Power can confirm that contractors working at Longannet Power Station in Fife have taken part in unofficial industrial action which is part of a UK-wide campaign concerning the issue of foreign workers. "Scottish Power employees are not taking part in the campaign and production of power supplies are not affected in the short-term." A worker, who wished to remain anonymous told BBC Scotland: "We're very happy working with foreign workers, we just want to know they have exhausted the British workforce first." "We think it is the thin end of the wedge to use foreign workers. "We're worried about unemployment, there's a recession on at the moment and there are plenty of skilled workers in Britain, unemployed, to cope with any work we're going to get. "It's about the right to work"